Lately, we’ve been thinking about how we can promote and share exceptional hosting practices. We know that some hosts on our site consistently receive exceptional reviews. What are the common characteristics of these hosts? As a first step in our investigation, we created a “Hospitality Index” that measures host quality across cities. Immediately, we saw stark regional trends in host quality and hospitality. Cleanliness — a foundational aspect of any travel experience. Check In — a crucial moment that affects the entire trip. Communication — the primary factor in resolving queries and forestalling any issues. Value — This one is a bit tricky because in some ways it encompasses all the other measures. But capturing a guest’s sense of the overall value of the experience is an important metric. Accuracy — expectation management is key to a smooth Airbnb experience. There’s a long history of criticism surrounding 5-star review systems. For example, scores tend to be binary (5 or 1). But we can be confident that a 5-star score is a good experience, at minimum. So for the index we looked at the percentage of trips (not reviews, which would be biased by review rates) where guests give 5-star scores for all of the above criteria. With over a million trips completed in the United States in the past couple years, we have a rich set of experiences, spread across hundreds of cities, to draw upon. And to ensure the signal is sufficiently strong, we filtered the list of cities to those that had hosted at least 500 trips in the last 2 years. Finally, we limited the trips to just those where the guest booked a private room in someone’s home, as opposed to staying alone in the entire home. It makes sense, doesn’t it? Southern hospitality rings through loud and clear with cities like Tampa, Raleigh, Memphis, and Nashville topping the list. Western creative enclaves like Mendocino and Eugene, along with Sedona and Santa Fe (in the top 20) also perform well. The list can be interpreted many ways; another lens we could use is age and employment. These are generally locations with big retirement and/or college communities, two groups of people with limited income and more free time. Conspicuously absent are big cities and the Northeast. This isn’t to say that we don’t have any exceptional hosts in these areas — we definitely know of many amazing hosts around the country — but in aggregate, they are outshined by our Southern and Western hosts. Going a step further, we wanted to understand what determines high hospitality scores. We ran a linear probability model to identify specific factors that influenced review ratings. The tables below show what factors either help (positive number) or hurt (negative number) host ratings compared to the baseline category (0%). Older hosts tend to be more hospitable (possibly because they have more free time and experience). On the other hand, younger guests tend to be more generous with their reviews. This could be because they are more used to leaving reviews on websites or because they have lower expectations for the stay. Gender doesn’t matter much on the guest side, but female hosts tend to get higher ratings than male hosts. As far as trip attributes, large groups give much lower ratings than small groups (we wonder what the host thought of these large groups?). 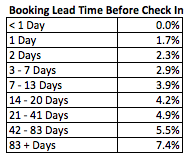 As far as the length of stay, very short or very long trips tend to review at lower rates. Guests who plan ahead end up happier, at least according to the above table. The longer in advance a guest books, the more highly they rate their host. This could be because they have a better selection to choose from, or because they’ve more carefully thought through their trip and have a clear sense of what they need in a host. Another factor we were concerned might skew results was guest origin. If guests from certain regions or countries tend to be more or less generous with reviews, could that be influencing results? We ran the regression controlling for guest origin and found it didn’t change the results in any meaningful way. We were pleased to see regional hospitality trends reflected in Airbnb data, and to also take a step towards understanding where our most hospitable hosts tend to live. Stay tuned for an international version of our Hospitality Index. Originally published at nerds.airbnb.com on July 22, 2013.